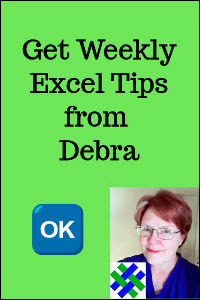 Watch this short Excel video tutorial to see the steps for combining text and formatting the results. To combine text from multiple cells into one cell, use the & (ampersand) operator. If the text is in a formatted table, the formula will show structured references, with the column names. If the text is not in a formatted table, the formula will show cell references. When you combine cells with text using the above formula, there is no space between the first and last names. To insert a space, or another character, you can include a text string in the formula. Instead of showing characters between the words, you can use the CHAR function, with 10 as its argument, to create a line break. This is the same as typing Alt+Enter in a cell that contains text. Be sure to format the cell with Wrap Text, to see the line break..
You can combine cells to join a text string with a number from a cell. In this example, text will be added to the payment terms. Type the formula, with text inside double quotes. For example: ="Due in " & A3 & " days"
NOTE: To separate the text strings from the numbers, end or begin the text string with a space. In the TEXT function, the date is the first argument, and the formatting is the second argument. "mm-dd-yyyy" OR "yyyymmdd" OR "ddd mmm dd yyyy"
NOTE: For other languages, use the applicable date codes, such as "jjjj" for the weekday name in French. 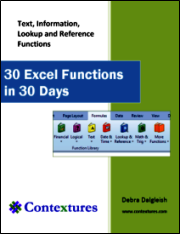 To see how to switch between languages, download the sample file from the Functions section on the Excel Sample Files page. Look for FN0046 - Change Language for TEXT Function. Here are a few examples of using the TEXT function to format numbers. ="Amount due: " & TEXT(A3,"$#,##0.00")& " USD"
Another way to combine text with date or numbers is to use a custom number format. In the Type box, type the text inside double quote marks, before and/or after the date format. 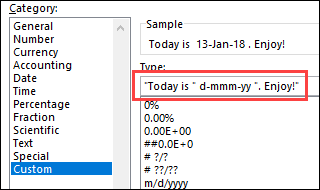 For example: "Today is " d-mmm-yy ". Enjoy!" To see the formulas, you can download the sample file. The zipped file is in xlsx format, and does not contain macros.